Alfred Wegener was a German astronomer, turned meteorologist who traveled to Greenland with two Danish expeditions in 1906 and 1912-1913. As early as 1910 he realized that the continents had probably once "drifted" apart to form the arrangement that we see today. In 1912 he gave several lectures in Germany concerning Die Herasbildung der Grossformen der Erdrinde Kontinente und Ozeane) auf geophysikalischer Grundlage ("The geophysical basis of the evolution of the large-scale features of the Earth's crust (continents and oceans)". It wasn't until 1915 that Alfred Wegener wrote the first edition of his book Die Entstehung der Kontinente und Ozeane (The origins of the continents and oceans) in which he tried to re-establish connections between geophysics and geology and geography. A link that had broken once each became specialized disciplines. In his book, he developed the idea of continental drift. Although not an entirely new concept, for the fit of the continents had been recognized as far back as the early 1600s, he used observations from many diverse fields to support his theory. 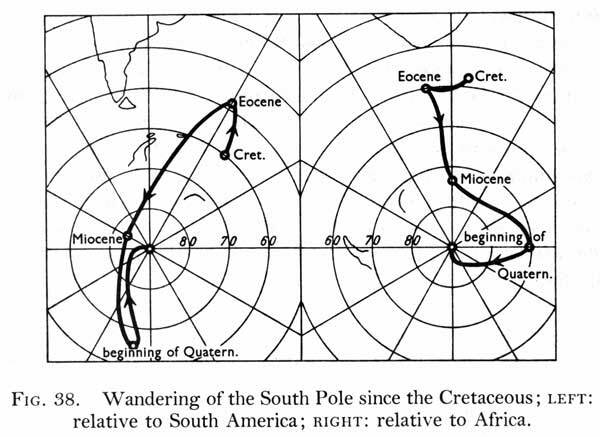 Below are some figures that Wegener used to support his theory of continental drift. Note that continental drift is not the same as plate tectonics. 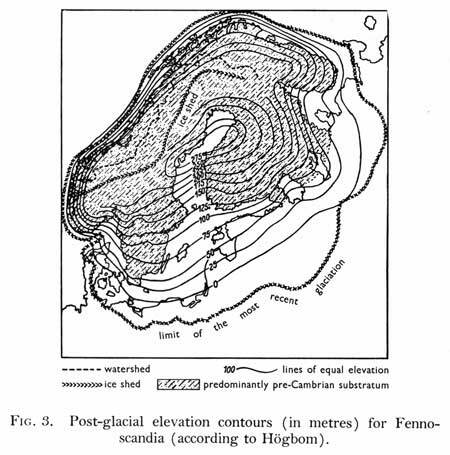 Geomorphic arguments: Post glacial rebound (isostasy) as evidenced by raised shorelines in the Fennoscandia (Scandinavian) region. Note that shorelines are up to 275 meters above the current sea level. That yields a calculated ice thickness of approximately 930 meters. In North American similar raised shorelines of 500 meters around Hudson Bay yields an ice thickness of nearly 1670 meters. 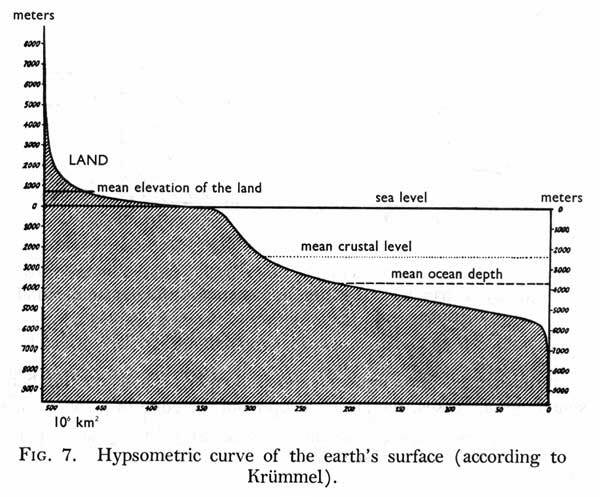 Geophysical arguments: Based on the elevation of the land surfaces and known undersea depths, Wegener was able to draw several hypsometric curves that relate elevation (depth) to the total area at that elevation (depth). He noticed that rather than a normal distribution of heights and depths, the continents and oceans have two very distinct, and different, average values. 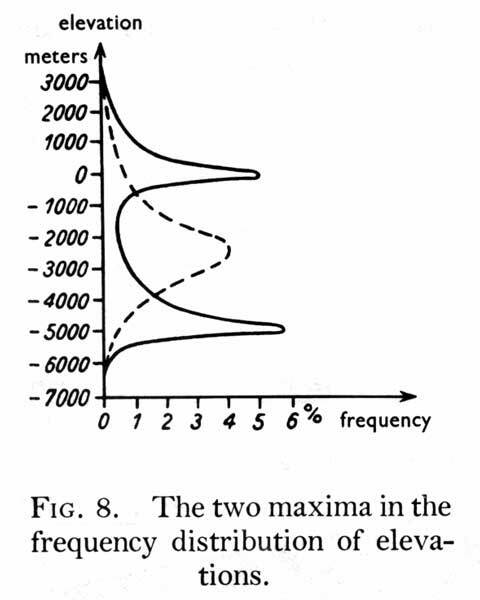 If you look at the frequency distributions, these two maxima become very apparent. 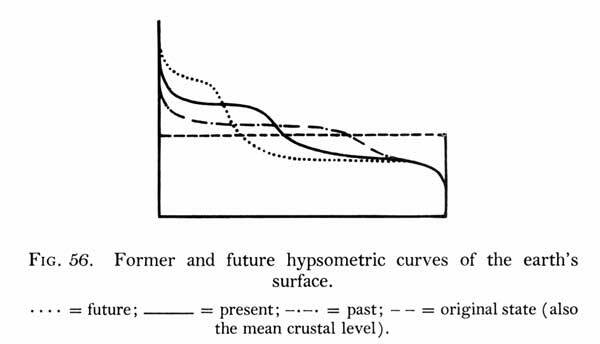 Note only did Wegener look at the current hypsometric data, but he also hypothesized about past and future hypsometric curves. Without going into too much detail, the curves will become more and more separated owing to continued evolution and differentiation of the Earth. Wegener also had access to seismologic records from Hamburg. 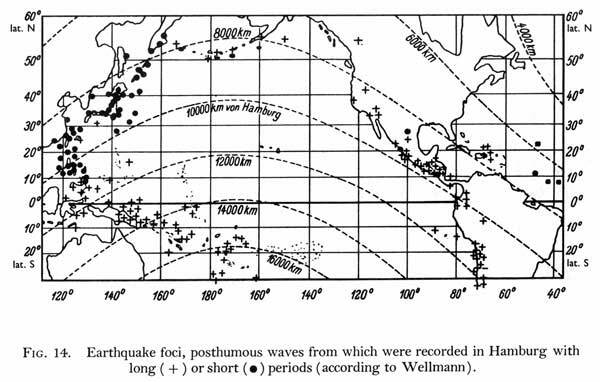 Here, we can see that most of the earthquakes that the German seismometer recorded define the edges of the Pacific Plate and are coincidentally situated along the "Ring of Fire". The ring of Fire are the volcanoes that surround the Pacific Plate. 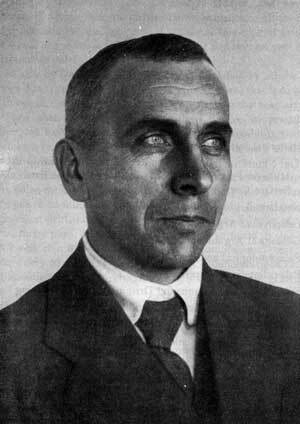 Wegener also used the fact that the magnetic poles were known to be wandering to help support his theory. Below we can see the Apparent Polar Wander (APW) curves for South America (on the left) and Africa (on the right). Note that the two curves do not match. That can be explained by 1) two poles different poles affecting the two different continents or 2) one pole, but the two continents are moving relative to one another. Geological arguments: Looking at the geology along the eastern edge of South America and the western edge of Africa, Wegener was able to point out striking similarities in the geology. 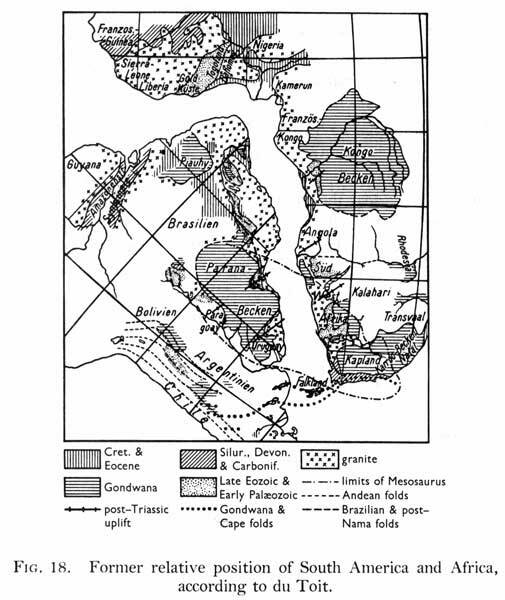 Since then, certain lithologic units, e.g., the Parana Basalts and the Karoo Basalts have been shown to have very similar major and minor element geochemistries. Not only are there rocks on continents that once look like they fit together, but there are rocks on many of the southern continents that all have the same age and could only be caused by the same thing - glaciation. In 1906 the Great San Francisco Earthquake took place. 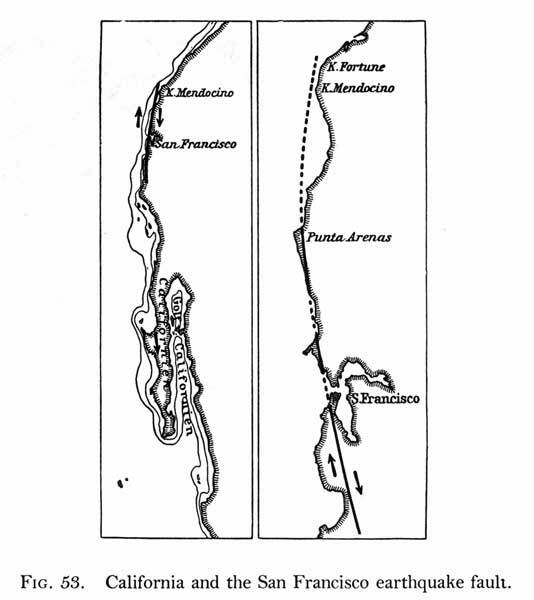 Wegener used that fact that the earthquake occurred along the San Andreas Fault to help explain the idea that the Pacific and North American plates were drifting past one another there. In the diagram below he indicates that the North American plate is moving south relative to the Pacific plate (which is moving north) near San Francisco. Plates could drift past one another, like along the San Andreas Fault in California, or they could rift apart from one another. This rifting produces areas of continental crust that is upthrown (horst) or downthrown (graben). These horst and graben are seen most easily in the Basin and Range Province of the Western United States, e.g., Nevada. 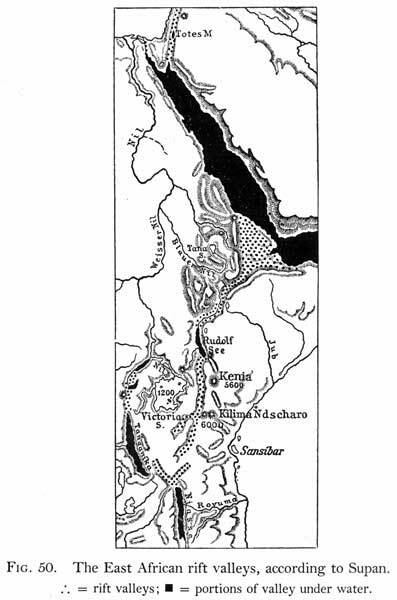 Not only can the continents rift apart and form the Basin and Range, but in some cases the rifting has opened new sea, e.g., the Red Sea in the Afar triangle region. After a continent has fully rifted apart, mature oceans will form between the two new continents. 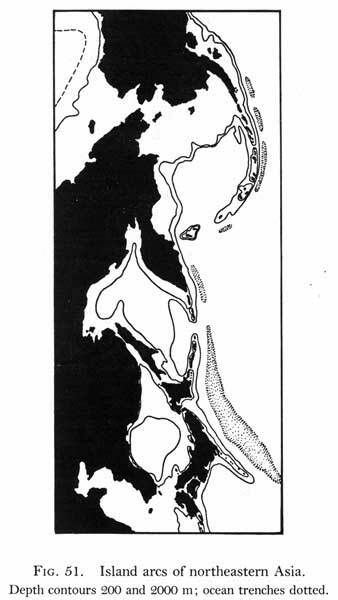 If continents collided they would form zones of compression which Wegener knew to be island arcs, like the Aleutians Islands. 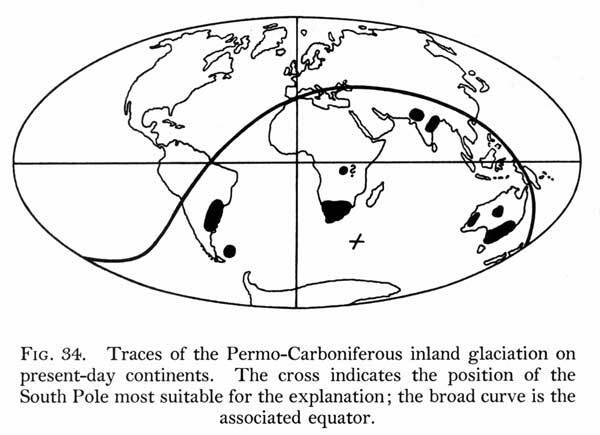 Although he correctly identified island arcs as having something to do with collisional plate boundaries, Wegener didn't correctly understand the reason for their formation. 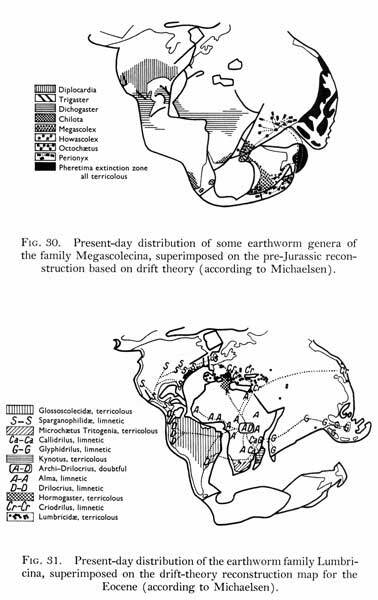 Paleontological and biological arguments: Wegener used information know about both extinct species (fossils) and living species (extant organisms) to help support his theory that the continents had once been attached. Below we see the distribution of two modern families of earthworms. It's pretty hard to imagine the same earthworm family being in North America, South America, and Africa unless the continents were once connected. 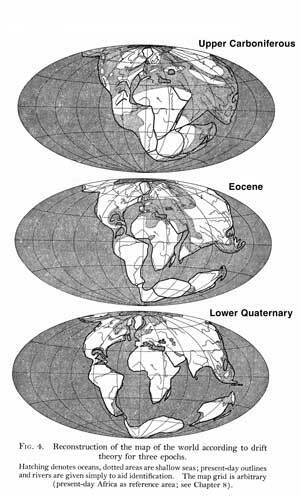 Based on all that evidence, which pleased the biologist, geographers, and paleontologist, but infuriated the geologists and geophysicists, Wegener proposed that the continents had once been connected to one another and had since split apart.